Cup cake wedding cakes can look stunning but they have been a hot trend for a number of years, so as with most things to do with weddings they are not cheap. Well, they are not cheap if you pay a cake maker to make them, if you make them yourself you can save a fortune and have a great looking cheap wedding cake. Making cup cakes or fairy cakes is fairly easy, we probably all had a go when we were children, so rather than listing ingredients, go and find your old recipe books and find your favorite. You can choose any number of flavors; chocolate, raspberry, lemon, vanilla, etc as each cake is individual. Have a taste test with friends and family as to which are the best. 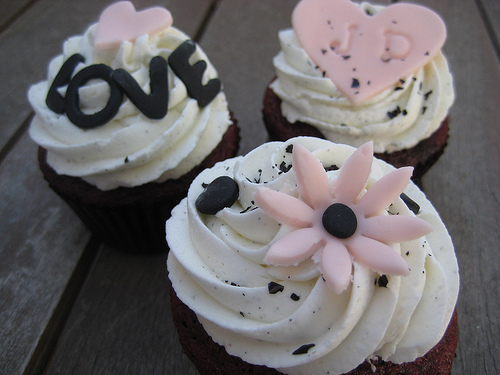 Love that cupcakes can be simple and still look gorgeous. This sweet stand of red spotty cupcakes would look gorgeous at each table and would make a lovely centerpiece too. The easiest and best looking way to decorate your cup cakes is to use frosting and then you can use many shop bought decorations to add an extra touch of glamour to your cup cake wedding cakes. Have a look at candy stores as well as cake decorating stores, there are lots of very cute kiddies candies that would be perfect to add to the top. For a more sophisticated look to your cup cakes you could have your monogram cut from fondant icing, you wouldn't have to decorate every cake that way, maybe just a few on each layer. Or sugar petals also look very glamorous. The best looking wedding cakes are those that are coordinated and you can do this with the decorations and also with the cup cake cases. The cases don't all have to be the same it is the overall look that you want to get right, you can alternate the different colors when you come to display the cakes on the day. 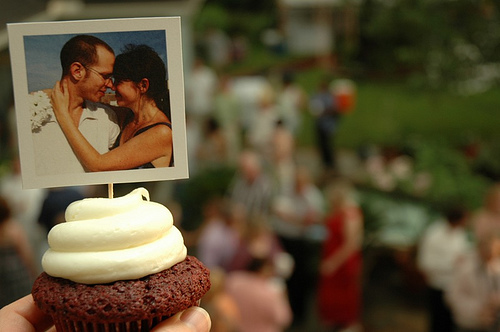 Love this idea of personalizing your cupcakes with a photo of the two of you. Or you could have a fun photo of each of your guests so that everyone knows whose cupcake is whose! 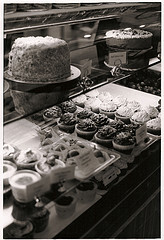 Although cupcakes are a fairly new trend at weddings, small cakes have always been part of a grand afternoon tea. 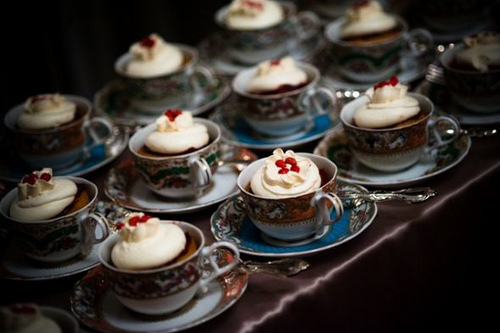 Love this idea of using vintage teacups to display the cupcakes, they look gorgeous. To make your cupcakes really wow the easiest way to do this is by having a cupcake wrapper. These wrap around the cupcake and do look stunning. The best selection that are reasonably priced is at Amazon. However as you can see from the photos on this page they are not essential if you use nice looking cupcake cases and they do add an extra expense. How you are going to display your cup cakes is what is going to give the wow factor to your guests. You can buy and also hire cup cake stands from most bakers or for a vintage look to your cupcakes have a look at thrift stores or ask your family if they have a cake stand that you can borrow. 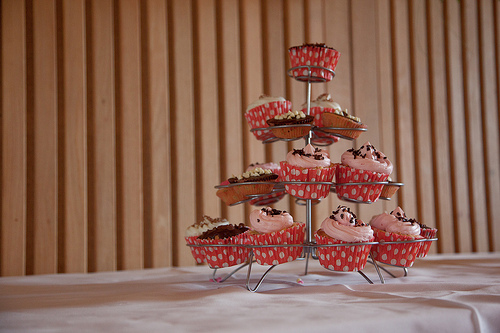 As you can see from this photo by CleverCupcakes you don't even have to have a 'proper cake stand'! If you use smaller cake stands you could have one for each table and then it acts as your table centerpieces as well, a double saving! 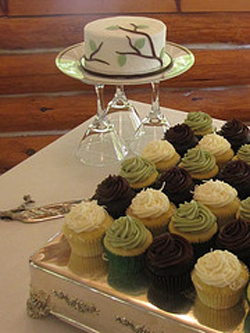 Some brides also have their cup cakes double as their place cards with a little name flag in each cake. 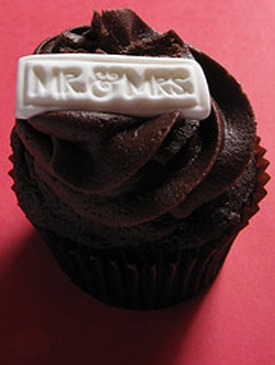 Have fun with your cup cake wedding cakes, looking forward to seeing your piccys soon! Ordering your wedding cupcake cake from your local Walmart or Costco (or your local store) is not such a daft idea as you are about to save yourself a fortune, which when you are planning a cheap wedding is definitely the way to go. Over the last couple of years the big supermarkets have started to produce some very beautiful cupcakes, with swirly icing and pretty flowers and in a variety of colors, which are perfect as a wedding cupcake. Start by looking at all of the lovely cupcakes that the stores close to you or your venue currently stock and if you can, treat yourself to a few samples - purely for research purposes and from your samples decide on the ones that you would like as your wedding cupcake cake. Next talk to the customer services or the bakery department and ask if you can order the number that you will need for your date. Notice that the word wedding has not been mentioned otherwise you end up looking at the catalog for all of their wedding cakes which are cheaper than most but still not as cheap as having normal cupcakes. Most stores will say that you will need to leave it closer to the date but make sure you have a date that you will need to order them by. It is worth ordering a few more than you will need just in case some get damaged or eaten! You will need a cupcake display stand which you can either make yourself out of plates and wine glasses or buy a cheap one on Ebay. As well as the cupcakes part you may also want to have a more traditional wedding cupcake cake that you can use for cutting the cake. This is normally a small cake on the top tier of one that stands to the side. Again, you can get these from your local store and they are described as celebration or special occasion cakes, notice that they are not called wedding cakes as they would be 3 times the price! The celebration cakes are quite plain but that means that you can add your own decorations to the top. You could decorate your own wedding cupcake cake with fresh flowers or ribbon to match your wedding colors or you could be a bit more unusual and have a unique cake topper. A simple and really effective way to decorate a wedding cake that has white icing is to buy some pre-made white fondant icing and a craft stamp with Mr & Mrs or your initials. Roll out the icing and then use the rubber stamp to make an impression in the icing, cut it out and then carefully stick the cut out onto the top of your wedding cake with water. As well as store bought cupcakes you could also have doughnuts, mini cheesecakes, even cheese! Here are some unusual wedding cakes and there are also lots morecheap wedding cake ideas.